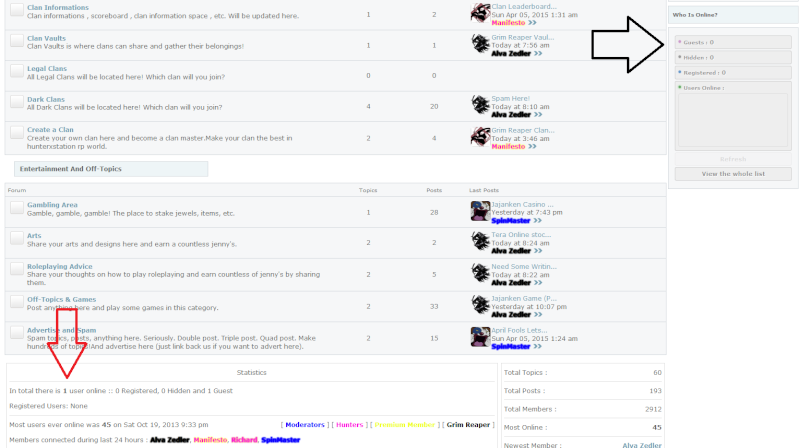 It is not often that one person finds a forum as beautiful and as full of features as HunterxRoleplay. Your homepage looks almost perfect. However, there are some disadvantages that I would like to mention. Your logo is really cool and I admire its elegant and professional design. Your navigation bar is minimal and suits greatly with your forum's overall appearance. Also, the censor that you have installed is very funny! One great thing about your community is the way you have chosen to organize your categories. They look pretty well, but the bold and colorful usernames may be exhausting for your visitors' eyes. In addition, the Who is Online? widget seems that it does not work properly since there is one visitor in your forum and this is me. You could take a look at the following image in order to see what I am talking about. Finally, I am not able to understand why there is a red box in the Greed Island category. Is it a mistake or is it on purpose there?